Wine Racks are placed to each side of the displays. Below the displays, cupboards and shelving are provided. Space is created for a 2 door under bar fridge in the centre of the back cupboard run. A timber boxed foot rest with brass tubing is installed along the front of the bar. Three LED down lighters (brass finish) are installed in the display units. The Bar is an “Island Design “and has 45 deg returns. 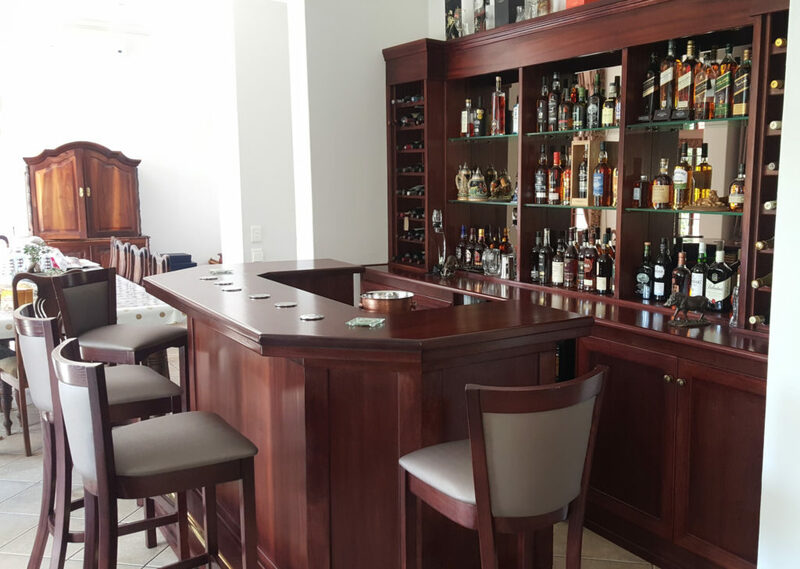 The Bar top and front serving shelf is made from solid Mahogany. The frontage of the bar and doors is constructed from Mahogany veneers with a solid Mahogany framework. The skirting, edging and capping is constructed out of solid Mahogany. The width of the top is 450mm. A serving shelf is installed below the bar top. Mahogany veneers are used for the divisions of the displays and the shell scheme of the cupboards. Three displays are installed against the rear wall. The displays have Bronze mirrors and 10mm glass shelves.